Crap I’m tired. Not just “I-needed-a-couple-more-hours-of-sleep” tired. Nope. This is the kind of tired I feel after several days on the trail in the deep cold and grabbing a few minutes of sleep here and there. And why am I so tired? Well there was a murder here last night – 12 homicides in fact. And for my dear friends who are privy to the insanity we’ve endured the last two years at the hands of some very bad people, no I did not finally snap. But thanks for going there immediately in your heads. Anyway, the murderer is a fox and the victims are, or were, 12 of my older chickens. Sasha was frantically barking but it was Solo, one of our malamutes, barking in a way I had never heard before that caused me to jump out of bed, put on my slippers, grab the gun and head out the door. As I rounded the corner of the shed I caught a glimpse of his tail. Big, Bushy. Black. White tip on the end. He darted away and into the woods before I could even raise the rifle. 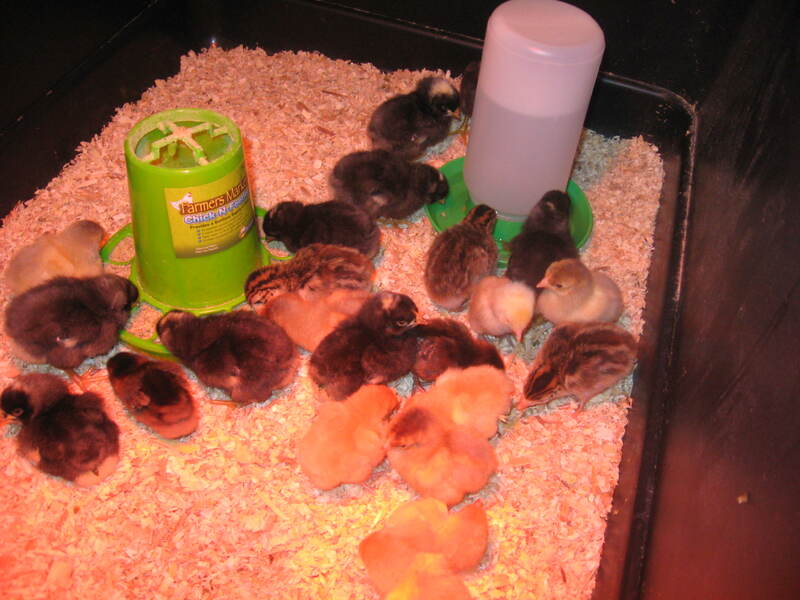 This was my first batch of chicks. After last night’s massacre I am left with a Buff Orpinton, a Wyandotte and an Americauna. There were chicken feathers every where. All but four chickens were still in the coop. One had headed for Darrel’s truck and wedged itself under the hood. Sadly it was so freaked out it just died. So there I was at 3:30 in the morning. Feathers were all that remained of my little birds. Even crooked toes, my favorite, was gone. I walked over to our field next door but that proved fruitless. And then I realized that to anyone driving by I probably looked like a crazed freak. Basically I was standing there in my purple girlie boxers, t-shirt, slippers and a rifle in my hand. Yup, welcome to the neighborhood. I never did get back to sleep. Tonight the fox and I are going to have a rather serious discussion about life and death. And yes I will be wearing pants. My legs and other parts are covered in mosquito bites. I’ll keep you posted. Now on to the bread. I may have mentioned before that this is the first summer in 34 years that I haven’t been employed. For quite a few years I’ve held various gigs in tourism which I love. But after a rough couple of years, a break was in order and so I am Suzie homemaker this summer. However I don’t think Suzie cussed quite as much as I have a tendency to do. I have chickens (well mostly have), vegetable plants that are actually growing (I have a tendency towards plantacide) and my next desire was to bake bread. Now I can make a mean bannock which for those of you not in the know, is an unleavened biscuit type of bread that is awesome with jelly. And my fry bread will clog any open artery. But bread bread – that’s new to me. And truthfully I’m undertaking all these projects to expand my skills. I can hunt, fish and trap. I know how to take care of myself in extreme wilderness conditions. Now I want to grow some food. I’m tired of paying $3 or more for a loaf of bread and $3 for a tomato – yes just one. 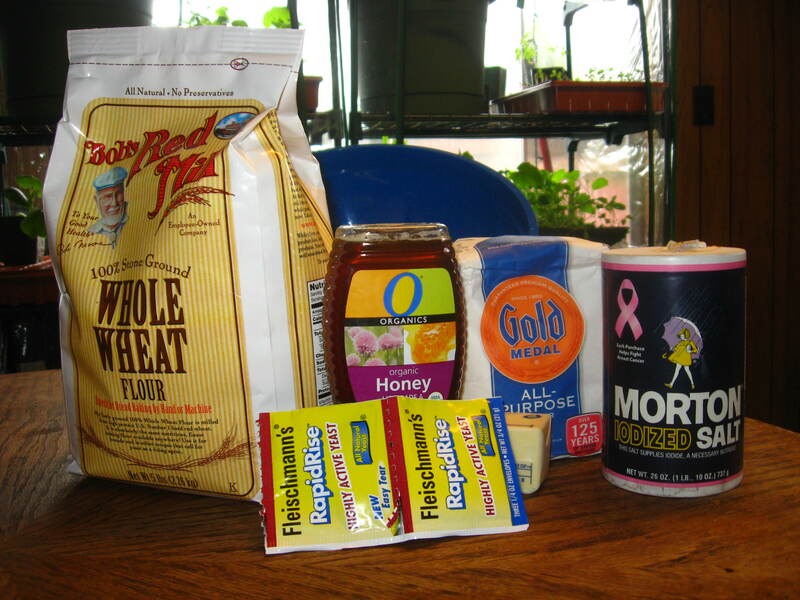 These ingredients will actually become bread. So my mission was to turn this into bread. Whole wheat, honey bread to be exact. I had my recipe. Ingredients. 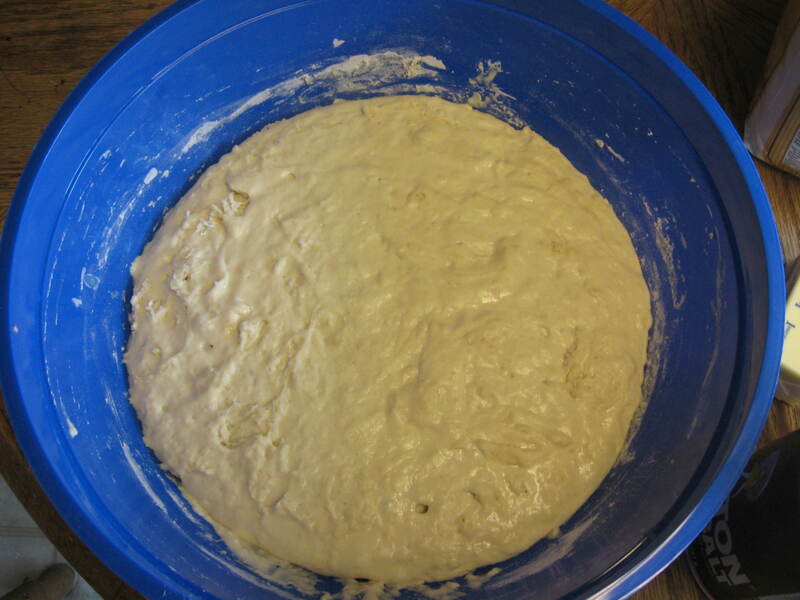 The first step was to mix flour, salt, water, honey, butter and yeast together and then let it sit for about 30 minutes or until it started to bubble. Thirty minutes went by. No bubbles. Thirty five minutes. No bubbles. Forty minutes. No bubbles. I checked the recipes. It said to put both packets of yeast into the mixture. Oops. I had used only one. Not to be deterred, I mixed the second packet of yeast with a bit of warm water and then folded it into the goo. Five minutes later I had bubbles! I am dubious about this becoming bread but there are bubbles so I must be doing something right. The next step was to mix in a lot of flour and some more honey. Check. Then I was supposed to cover it and let it rise. Well that was easy enough. 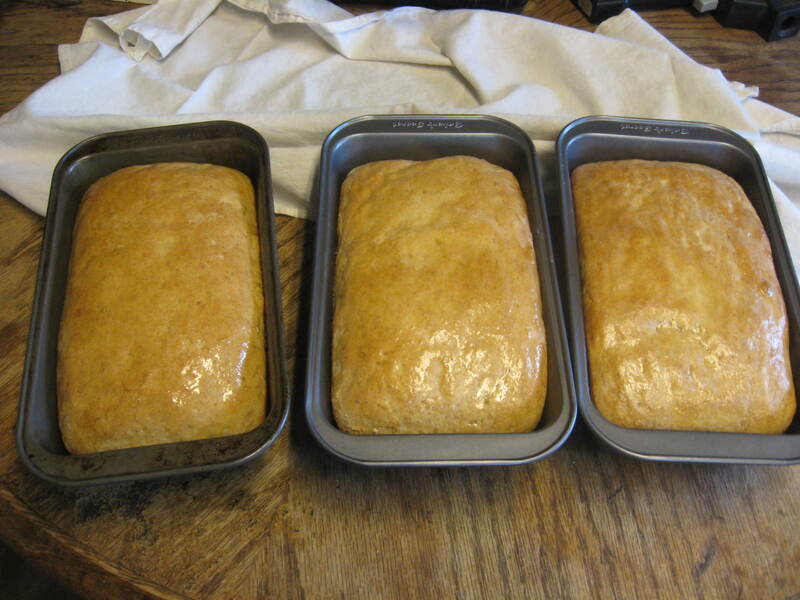 Now let me mention that I had decided to bake bread on one of the hottest days of the summer. I thought I was being a smarty pants by starting the project in the morning. I had no idea how long it would take. By the time the bread was rising our indoor thermometer read 83 degrees and I hadn’t even turned on the oven yet. Just waiting for it to rise a bit more. It’s actually looking like bread much to my surprise. 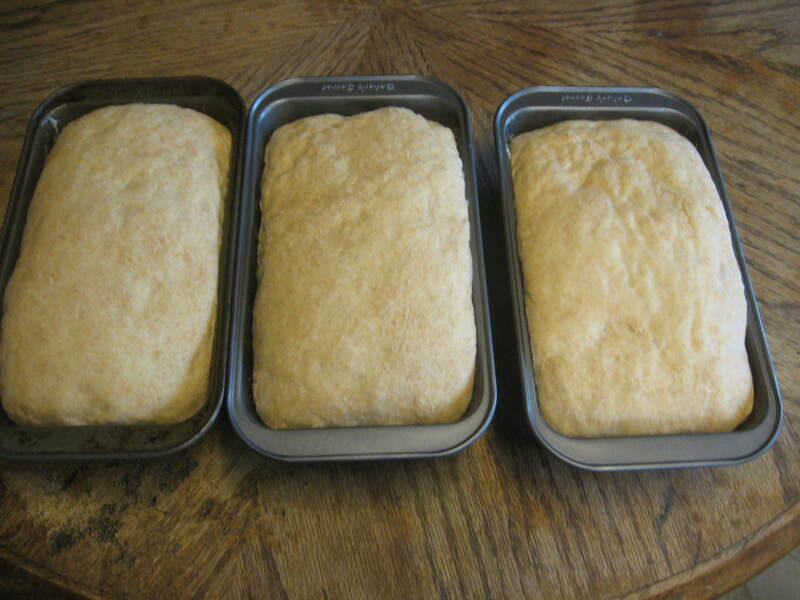 The dough finally rose to the appropriate height and I divided it into three and put one batch in each of the pans. The concoction was supposed to rise a bit more so it was time to pre-heat the oven. Our oven is gas and ancient. There are apparently homes where one turns the dial to say, 350, and after a period of time the temperature is exactly that. Not our oven. Some days the dial should be on 200 in order for the temperature to be 350. On other days it has to be jacked up to 400 to get 350. And once in a while you get the exact temperature and check a few minutes later only to discover that the oven has had a hissy fit and is now broiling whatever is in there. I prayed to the oven gods and reminded them I had already endured the yeast incident. The pans went into the oven and 28 minutes later he’s what came out. The finished product! And let me add it was delicious! Darrel arrived home from work just a few minutes later and said the place smelled great but it seemed to be a little hot. Yeah, no kidding! Thanks for reading the blog! Sometimes writing is like talking to yourself…LOL. I am going to have a nap so I can stay up tonight and hopefully get that fox! Lost effort to stay awake 😦 😦 They know if you are. I lived in a cabin north of Tanana for several years. Got 8 geese figuring to have some eggs during the summer then different meat during the winter. Lost one so stayed up all night till fell asleep at about 4am and lost another. Next night went out early but lost another late. Next night went out late but lost one later. Finally herded the survivors into an unused back room for the rest of the summer. Thanks for the great chuckle Grant! I have a feeling that staying up all night might be a losing battle. My little survivors are already in a temporary pen in the garage! I am off to Home Depot tomorrow to buy some supplies to tighten up the coop. You lived north of Tanana? Tough and beautiful country! Did you do any trapping? Foxes and I have a long distaste for one another. I was so proud of my very first fox sets years ago. Then the fox took the wind right out of my sails by taking all the bait and peeing ever so carefully around every trap. Ah my darling sister. You are still witty I see. How is that neurotic dog of yours? LOL. Sorry to hear about your chickens. How did the bread turn out? Sounds good to me. I took a Cruise to Alaska last summer and went on the dog training tour at the summer camp. Had a good time, enjoyed listening to the information about training of the dogs for the races. Made video tape and something happened to my video and I lost all of it. The bread was delicious and truthfully I’m not a big bread eater but I was happy to have lots of toast with my tea. I am so sorry you lost your video. This may be a long shot but when did you visit? I have lots of video and pictures from Juneau. Maybe some of it is of your tour? I can take a look if you give me a date.